The Universidad Tecnológica Nacional (UTN) presents two characteristics that make it different from other national universities: · UTN is the only university in all the country that has as prior objective the formation of qualified engineers. The term “Technological” means that the university only offers careers dedicated to the study of Engineering. 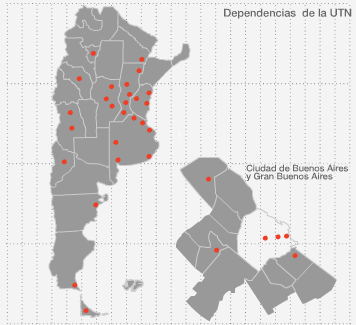 UTN have a federal character to include all regions of Argentina. Its 24 Regional faculties and 5 Academic Regional are located in the Northeastern region: provinces of Chaco, Entre Rios and Santa Fe -Northwestern region: provinces of La Rioja and Tucumán – Center: Capital Federal and Provinces of Buenos Aires, Córdoba and Mendoza – South: Provinces of Chubut, Neuquén, Santa Cruz and Tierra del Fuego. he educational policy of UTN consists of the offering of different career opportunities adapted to the requirements of each particular region where the Faculty is settled, and these particular regions are developed industrial areas of Argentina. This represents a continuous and intimate connection with regional productive systems, and a prosperous academic exchange at a national level. On the other hand, its geographic extension translates to student capacity of 70.000, that represents more than the 50% of the all the engineer students of the country.